Dollar Rises on Weak Data, Is this a Bottom? 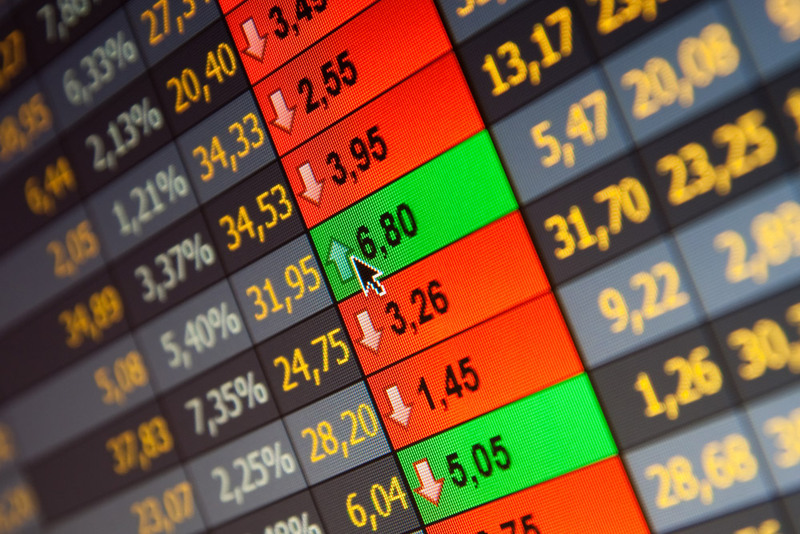 The U.S. dollar traded higher against all of the major currencies today and its strength in the face of exceptionally weak retail sales numbers has many investors wondering if the currency has bottomed. The most important event risk this week was retail sales and according to the latest report, consumer spending contracted by -0.3%. Given the recent uptick in wages and improvement in the labor market, many economists (us included) anticipated an increase in spending. However to everyone’s surprise consumption fell for the second time in 3 months, paving the way for a weak first quarter GDP report. In fact, we saw no increase in spending in the first 3 months of the year and it will be very difficult for the Federal Reserve to justify raising interest rates in June if we do not see retail sales rise more than 0.5% in each of the next 3 months. When the dollar moves higher despite such an abysmal report, market participants start to wonder if the softness of the U.S. economy has been completely priced in and that the dollar’s downtrend is finally over. 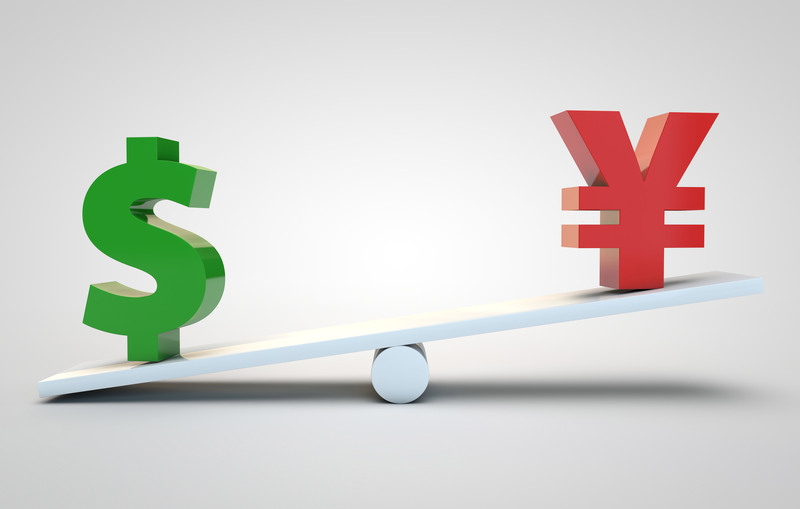 Considering that the rest of this week’s economic reports are not expected to have a dramatic impact on the dollar, we would not be surprised if the greenback continued to recover but once some shorts have been shaken out, the downtrend should resume. The improvements reported by the Fed’s Beige Book is not consistent with most recent economic reports. While the market has completely ruled out tightening by the Fed this year, if each piece of incoming data continues to worsen ahead of the June monetary policy meeting, the dollar will fall as investors start thinking about rate cuts. 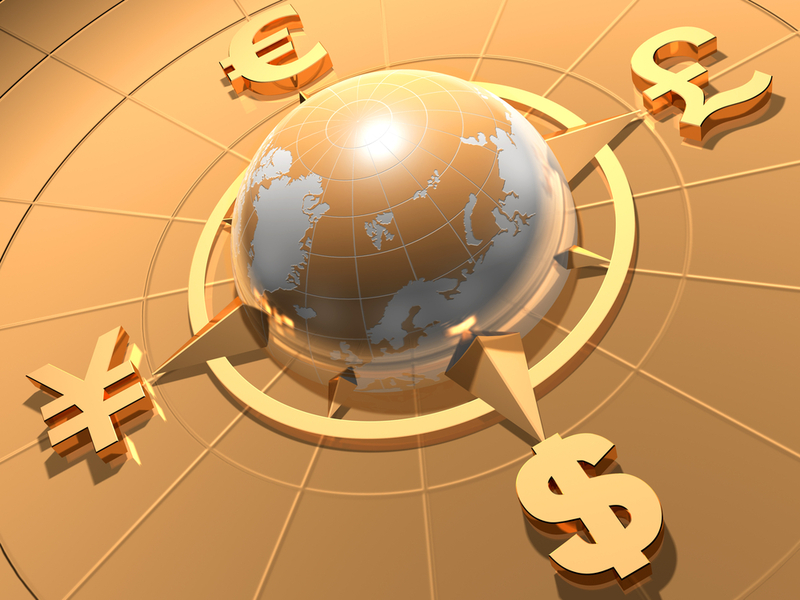 After consolidating above 1.13 for the past 10 trading days, euro ended the North American trading session sharply lower against the U.S. dollar and a move to 1.1260 would confirm a near term top. 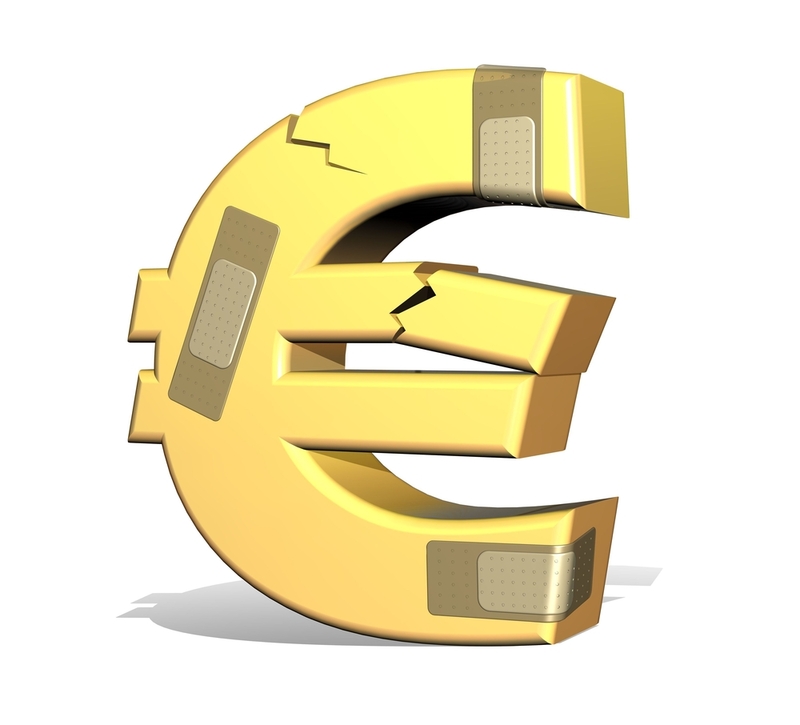 Weak Eurozone industrial production sparked the sell-off but it was the recovery in the dollar that drove the pair to fresh 2 week lows. If 1.1260 is cleared, the next stop for EUR/USD will be at least 1.12 and possibly even 1.1150. Eurozone consumer prices are scheduled for release tomorrow – the recent rise in German CPI points to a stronger release but the market’s appetite for U.S. dollars will dictate the performance of the currency. Meanwhile the Canadian dollar also shrugged off the Bank of Canada’s optimistic monetary policy assessment. The BoC left interest rates unchanged and while they expressed some concern about the level of its currency and its impact on the non-resource sector, they also revised up their 2016 GDP forecast to 1.7% from 1.4%. This move reflects their positive outlook for the domestic economy and their belief that the output gap will close sooner than anticipated. However with oil prices pulling back, USD/CAD could not find the momentum to extend lower and now appears poised for a stronger potential recovery before another leg lower. 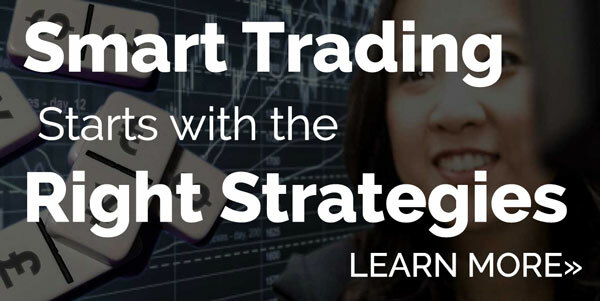 Now that the BoC rate decision is behind us, the focus will shift to sterling and the Bank of England’s monetary policy announcement. 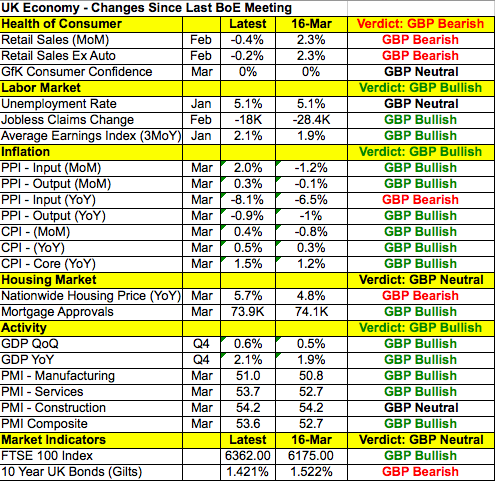 Since the last BoE meeting, we’ve seen widespread improvements in the U.K. economy. The following table shows upticks in manufacturing and services, higher wage growth, lower jobless claims and rising consumer prices. Unfortunately spending remains weak and Brexit poses an ongoing risk to the economy. The last time we heard from the BoE, they warned about the impact of Brexit on spending but spent more of their monetary policy statement talking about looser financial conditions, strong spending and their concerns about second round CPI effect on wages. A similar tone could be seen this time around. Finally the Australian and New Zealand dollars also moved lower against the greenback. 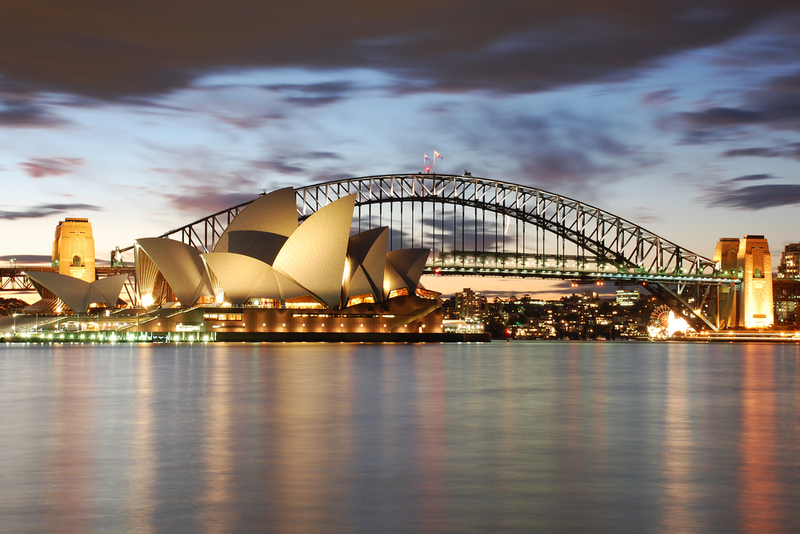 Australian employment numbers are scheduled for release tonight and stronger numbers should propel the currency to fresh highs while weaker numbers could deepen the correction.